Our client in Greystones wanted her own unique, functional kitchen, so with plenty of input we created a compact yet contemporary space to suit her requirements. Following the mid-century theme, we used solid teak hardwood for the doors, drawers and island. All internals were made with Baltic Birch with everything set off perfectly with the Carrara marble island. We also manufactured cabinet handles to emulate a cherished piece of family furniture with beautiful results. As a finishing touch, the walls were painted in ‘Railings' by Farrow & Ball. This project takes pride of place in a thoughtfully designed new build in Co. Meath. Our clients came to us almost three years before they started building with a clear and concise vision of their dream kitchen. Our task was to advise and refine the details to bring it all together. The resulting design was a team effort focused on a unique, individual outcome. Boasting magnificent views of Killiney Bay, this kitchen needed to fully embrace it's tranquil back drop. As the client was a keen cook, we concentrated first on practicality. We incorporated two separate natural granite preparation areas, coupled with carefully selected aged brass ironmongery to complete the scheme appropriately. 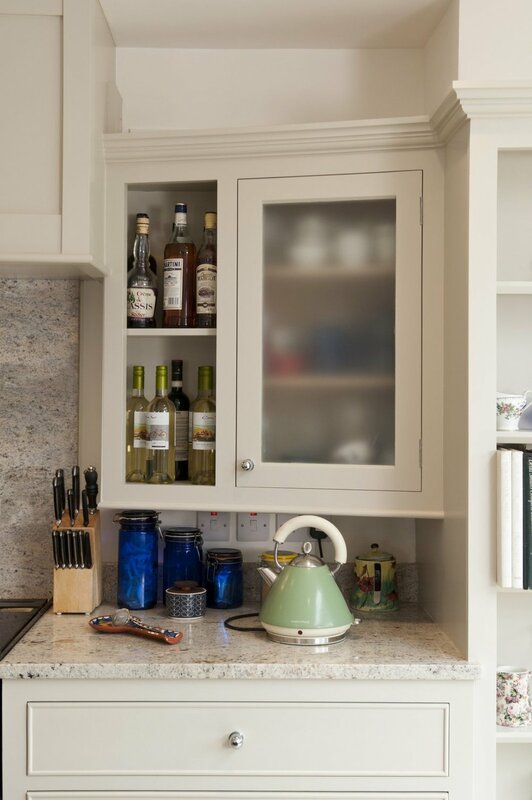 At the client's request, we installed plenty of storage to ceiling height, and a glazed display cabinet for favoured crockery. The unusually shaped island introduces a welcoming circular seating area at one end to complete the look perfectly. 'Give me more storage' was the essence of the brief for this kitchen. We didn't waste a millimetre of space and found a place for everything within three steps of the hob. Plenty of deep drawers and two larders with bespoke interiors gave us another happy client. The owner of this house had grown frustrated with her old kitchen. It lacked natural daylight and therefore became the catalyst to extend and improve. For this bright new space we designed a super efficient layout with a feature island painted in a deep blue shade. Our customer didn't want anything overtly contemporary - "simple, unfussy and easy to get around" was our design brief. The contemporary formica worktops were constructed from Scandinavian Birch plywood, with bespoke interiors to all the drawers. All finished in a fresh white shade called 'Shirting'. A lovely couple had returned home from England to refurbish this once dated bungalow. Our task was to provide a welcoming, efficient and friendly kitchen that would give two dedicated cooks years of trouble-free service. Hand painted in a fresh green tone with solid Beech worktops that will age beautifully. Our clients were building a new house in Monkstown and wanted refrain from installing a "statement" kitchen, just something that did the job quietly and efficiently over time. This design included Iroko worktops intended to age beautifully over the years with the finish in a contemporary grey tone ‘Silt’ by the Little Greene Paint Company. The solid timber joinery throughout will provide generations of convenient service. Our clients had purchased a cottage near the beautiful shores of Lough Derg as a refuge from their busy professions. We were given a free hand to sketch, design and install a kitchen with its own individual character, yet all with a strict budget in mind. 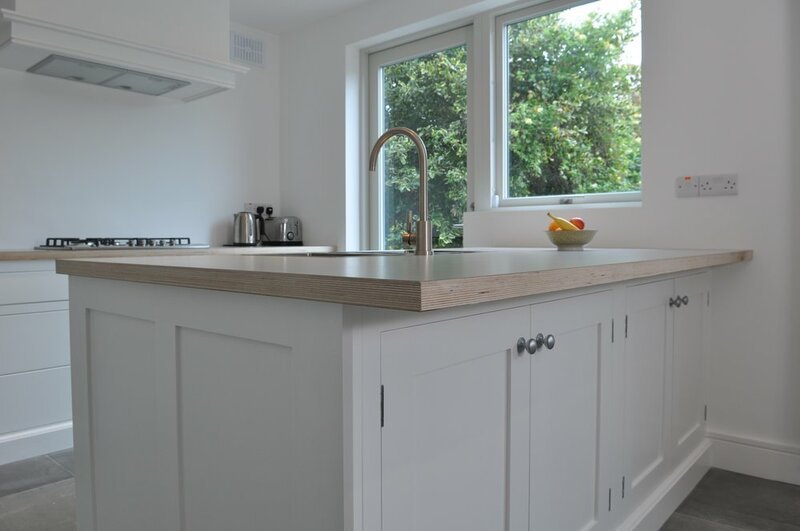 The worktops were constructed out of Beech with an end-grain feature chopping board and the cabinets finished in 'Mid-Lead' grey to compliment the Beech countertops. A compact, easy to navigate, country style shaker kitchen. The design concept here was focused primarily on the island, with the clients requesting a large curvaceous worktop. The linear design includes tall cabinets, glazed wall units and open shelving throughout. Complimentary colours were added to the island in 'Inchyra Blue', with the cabinets receiving a finish in 'Mid-Limestone'. We also provided the non-standard internal joinery, including the large opening doors to complete the overall scheme of the kitchen.